While improving your game is all about technique, improving your score is about strategy. Lack of technique can be (at least partly) compensated by a good strategy, the proper mental attitude and a good understanding of the dynamics behind the golf shot. On this page we will discuss five key points to help you improve your strategy and lower your score. To improve your score, you have to learn how to play the game, not how to swing or how to hit the ball farther. 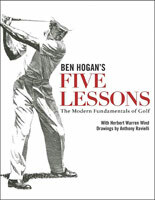 “Too many people tend to forget that the real object of the game, once the round is under way, is not to make pretty swings or hit pretty shots, but to find the wisest, most efficient way to get the ball into the hole in the fewest strokes possible………………. And everything starts from having the right attitude: play for what you know you can instead of what you hope you can do…..Play comfortable. I think this is the best advice I can give anyone about actually playing the game. It’s the road to consistency. It’s so simple but it makes a huge difference !” (Raymond Floyd – excerpt from the book: the elements of scoring). 2) Putting, Putting, Putting. Did I say putting? If you want to be a scorer, you have to be a good putter. Whether you are a beginning or a seasoned player, you will have noticed (or you will soon do…) that putting has more effect on your score than any other area of the game. Additionally putting is the final “call”. While you can always try to recover with your next shot if you miss a swing or an approach shot, if you miss a putt, there is no recovery rather than adding one more stroke to your scorecard. This is why putting has an immediate effect on your scoring and on your mental game. Good putters gain confidence and go to the next tee shot full of positive energy, while bad putters go depressed or angry, which will in turn affect their swing, too. Hence, like we said at the beginning, if you want to be a scorer, you have to be a good putter! To learn how to improve your putting game, see our section dedicated to putting. The ability to play the right shot at the right time and plot his way round the course is what made Jack Nicklaus the most successful golfer ever. Many other players had better swings and a more stylish short game, but nobody could beat Jack’s strategic approach to the cours. So, performing a good course management analysis upfront is a key to lower the score. How should you do this ? 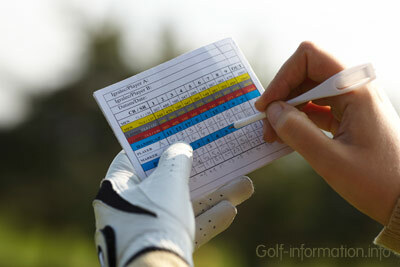 3.1) check the yardage/distance chart to plot your shot strategy till the green. 3.2) always play away from trouble (it seems obvious, yet it isn’t if you don’t plan it carefully). 3.3) choose the set of golf clubs according to the course design. 3.4) always play to leave yourself an uphill putt. “Golf requires patience and perseverance. There are no shortcuts……….When Butch Harmon and I overhauled my swing during the 1998 season, Butch would have me repeat one movement for 30 minutes. I would get so tired it felt like my arms were going to fall off. 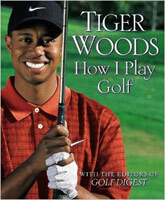 But I kept it until the move became ingrained in my muscle memory” (Tiger Woods – excerpt from the book: How I play golf). The more you practice, the better you will understand how slope, lie, ground and other external factors (wind and rain) affect the ball fly. “When most amateur golfers go to the driving range to practice, they take with them a driver and a selection of irons…….Surprisingly, no thought whatsoever is given to pitch shots, chip shots and bunker play. And yet it is the short game, the shots played from around the green, which can, potentially have the most profound effect on their score and, consequently, their handicap” (Tony Dear – excerpt from the book: Good Golf – made easy). How to improve your game and how to improve your swing.